The family of colourful segment lights has a new addition. Z629 is round pendant light fitting from PETG segments covered with translucent foil. Apart from various colours of the foil, it is possible to have logo or any lettering made to order and customize the light fitting for any space and brand. 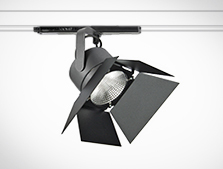 S412 is a new luminaire that was inspired by customers' requests. 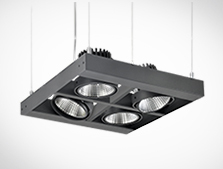 It is a compact light fitting based on our popular S800, but in square design. You can choose from various beam angles and power outputs and for COB version also additional glass, linear spread lens or honeycomb. 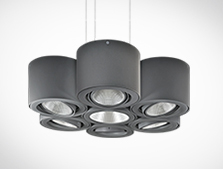 Pendant luminaire with cardan system that allows rotation of individual reflectors and choice of four beam angles. Thanks to its versatility is the luminaire particularly suitable for illumination of car showrooms and business premises. 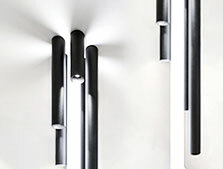 Modification with three light sources is also available as a wall-mounted version. L314 is a subtle luminaire for a three-phase feeding tracks with a control gear integrated in the tracks. Having simple and clean design and multiple mounting options this is an ideal luminaire for wide range of applications.